Starting July 18, 2017, Cosmic Ray’s Starlight Café will be added to the list of Walt Disney World restaurants offering Mobile Order. 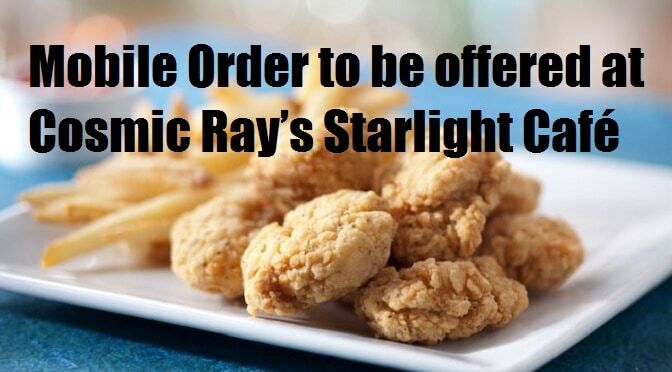 Before placing your order with a cashier at Cosmic Ray’s Starlight Café, you can now decide if you would like to pre-pay for your quick-service meal using Mobile Order. This Magic Kingdom restaurant will be easy to access through Mobile Order beginning July 18, 2017. For full menu options, pricing, and times please visit Character Locator. To make your order through the Disney World app, select “Order Food” and select your chosen restaurant, in this case it would be Cosmic Ray’s Starlight Café. You’ll then begin to “Build your order.” Just click upon an item you may be interested in and it will take you to another screen where you can choose to click the “Add” button. Then, click that little icon at the top above that looks like a briefcase with fork and knife. You will then be given a review screen to make sure you have all the items you want in your briefcase. Once you have reviewed your order, use your credit card on file with your Disney account to place your order. When you near the location of Cosmic Ray’s Starlight Café, click the “I’m here” button to notify the kitchen that they should prepare your food. Once your order is ready you will be notified to come to the counter for pick-up. At this time, Disney Mobile Order payments can only be made with a credit card or debit card. If you would like to use any discounts, gift cars, or Disney dining plans available to you, place your order in person at the restaurant. What do you think about Disney’s Mobile Order? Any whispers about being able to use the dining plan soon? Disney said it will be a while before tying it all together. I think the idea is great but really do wish they would begin excepting the dining plans. Especially before free dining begins in the fall.